TandemThings: Happy 10 years of Tandem Things! Happy 10 years of Tandem Things! This weekend my brother Mike and his wife Thea are out in London celebrating 10 years of marriage - and along with wishing them well, this got us thinking about how it marks 10 years since we received our first tandem, Dobbin, and made out first tandem tour. And a very memorable few weeks it was -- let me retell the tail. Dobbin was delivered to us around the 1st September, 2004. That first Dobbin was British Racing Green in colour. Unfortunately, he had a nasty dent in his top tube from a fork-lift accident in shipping. [And unfortunately the ravages of time against digital filing discipline mean I no longer appear to have any photos of him -- there maybe some analog photos in our loft back in London!]. Anyway, he was still perfectly ridable, so after a short and slightly wobbly test-ride out from the flat we lived in at the time, we decided to participate in a group ride from Richmond to Windsor that coming weekend (on Sunday September 5th, I believe). At this time, nether of us had ever been on a bike club ride of any sort; never worn lycra padded shorts; never even heard of drafting. It felt a bit like an induction by fire! The ride was a charity event, but we knew it was on because some participants in the "Cycling Plus" online forum were arranging to meet up "in real life" at it. 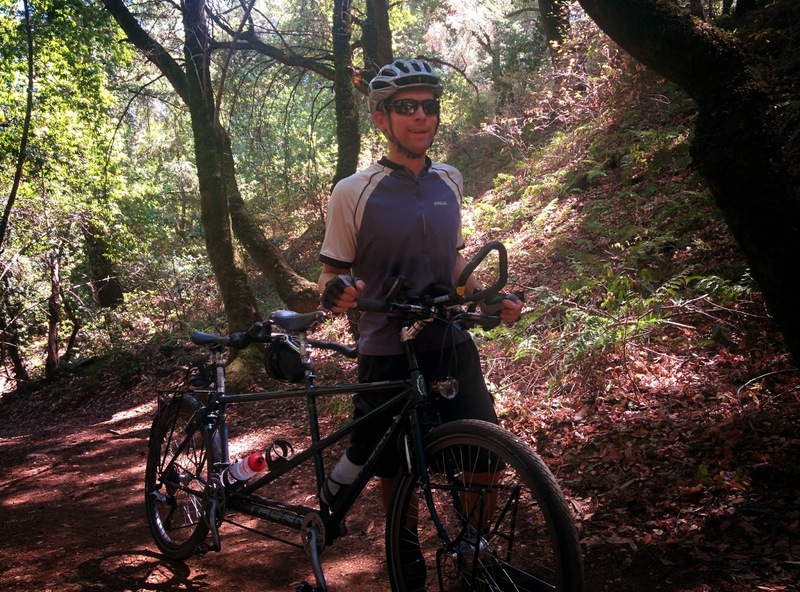 We'd been following this forum closely while planning our first tandem purchase, mostly as "lurkers". We didn't even mention we'd be there for this ride: we figured we'd check them out from a distance and if they looked suspect, we could then slip away without notice! How different events could have been: as it turned out, IRL they looked safe enough (looks can be deceiving!!) so we went up and introduced ourselves, and met a number of friends that we keep in contact with to this day; mostly via the yacf.co.uk forum that is the great-grandchild of the C+ forummers. Charlotte, Vicky, Graham, and Spesh were amongst those on that ride. Not only did we meet some good friends that day, but some of our greatest inspirations too: when Charlotte visited us in California this summer I mentioned to her how she was the reason we ever got into longer (>200km) distance randonneuring. We followed her complete her first SR series (200, 300, 400 and 600km rides) a few years later, and I think that's the moment I thought to myself, if someone perfectly normal and pleasant like Charlotte could take on and achieve such feats, maybe I'd be able to one day too! So, the ride went really well. We learnt so much. We had our first experience of a group of pretty serious looking cyclists hanging on our back wheel. We saw our first Brooks Swallow saddle (and how horrid I thought it looked!). We discovered the plastic saddles that had (incorrectly) shipped with our Thorn Adventure where not for us, and redoubled our resolve to get the B17s we had ordered. We surprised ourselves by not only doing the "long" route option out to Windsor, but also riding right the way back home with our new friends - possibly making it a 70 mile day, our longest to that date. Having succeeded in such an enjoyable and noteworthy ride, you might have thought we were done for tandeming for our first month. But no! 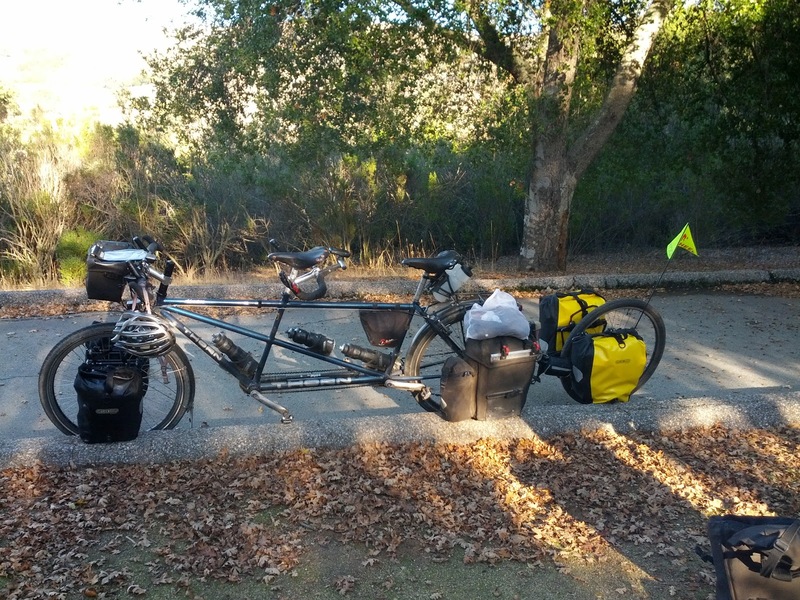 Just a short 5 days of work later, Friday evening on the 10th Sept found us loading up our tandem with 4 panniers stuffed full of camping gear, clothes, and everything we'd need for our first week-long tour. Neither of us had cycle-toured before. Neither had ridden a fully loaded bicycle before, let along a tandem, so setting off through the Friday evening SW London commuter traffic was again rather a trial by fire! We made it to Richmond park and were able to ease off a bit and take stock. Tempting to camp there our first night? No.. we pushed on and got all the way to the East Horsley campground - some 20 miles from our London flat. The following day we topped it with an 80 mile fully-loaded ride to Portsmouth and over the ferry to Ryde on the Isle of Wight. We found our campsite and checked in just before 8pm - I remember the girl at the checkin desk (in the adjoining pub) saying "sorry, the kitchen has just closed" and the landlady overhearing, taking one look at us both, and declaring No it Had Not just closed, grabbing the phone and telling the chef to bring up whatever two hot meals he had most readily to hand. 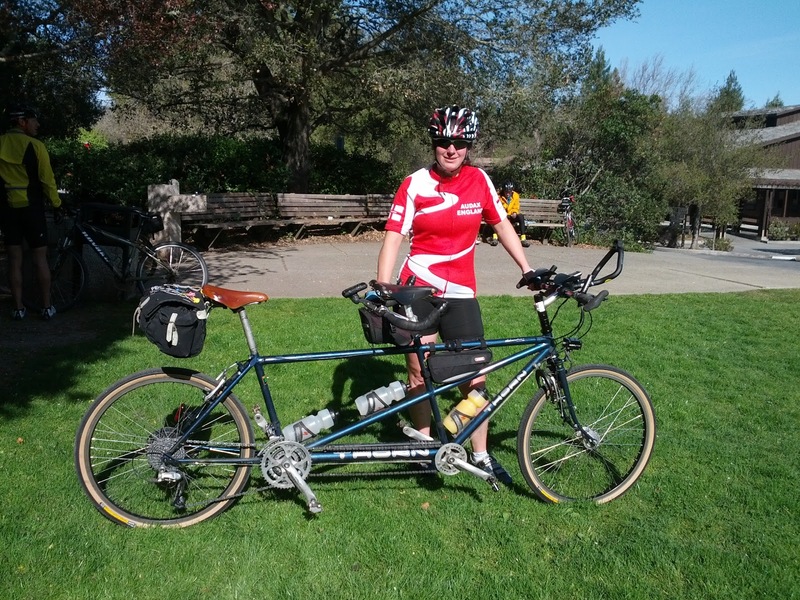 Our first experience of the wonderful kindness you can receive when traveling by tandem! So over the next week we toured the Isle, back over to the New Forest, Salisbury, Wylye Valley, and finally arrived at the Best Western just outside Bath on Friday 17th, looking rather road-weary but happy, and ready for my brother's wedding the next day! In the ten years since then, Dobbin has toured with us on many occasions and in several continents. The winter we returned him for frame repair which is also when he changed from BRG to the custom dark metallic blue he sports today.